Your vacation time is precious, so make the most of it by choosing an extraordinary destination like the North Georgia cabin rental Cozy Lakeview. With breathtaking picture-postcard views of Lake Blue Ridge framed by a canopy of trees and a majestic mountain backdrop, this very special place will calm you down, soothe your mind, relax your body and renew your spirit. Located in a gated community on two wooded acres on former Native American land - many arrowheads and stone tools have been found right outside the door - the cabin is just six miles from downtown Blue Ridge and minutes from the Toccoa River and all the land and water activities the Aska Adventure Area has to offer. 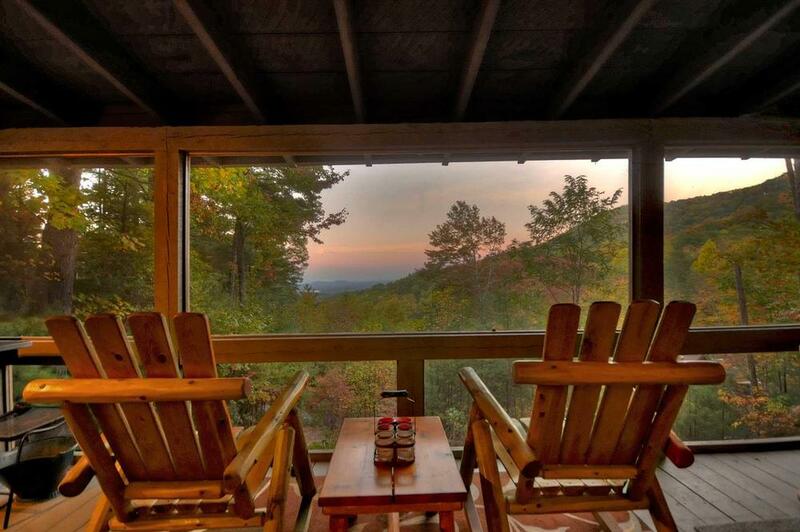 Aska means 'winter retreat' in the Cherokee language, but Cozy Lakeview is spectacular year-round, with breezes to cool you in summer as you sunbathe or stargaze on the deck, and a covered screened-in porch to shelter you as you enjoy the mountain air. The recently renovated real 16' chink log home, with its vaulted ceiling and wooden beams, has windows on three sides that flood the main areas with light and the beauty of Mother Nature. The interior is a professionally decorated mix of antiques blended with a modern flair, with updated colors and design elements and locally crafted accents. Comfortably appointed with leather sofa, new reclining chairs, a plush rug covering hardwood floors and a wood-burning Franklin stove, the living room is warm and inviting. You can settle in for an evening of conversation and entertainment, as the 43" flat screen Smart TV is equipped DVD and music channels. Games, puzzles and wireless Internet are available. The kitchen features black appliances, gas stove, a crock-pot, drip coffee maker and everything you'll need cooking and serving an intimate meal. In addition to a custom-made movable island/breakfast bar with two stools, the dining table seats four, expandable to six with a leaf and the extra chairs in the master bedroom. Outfitted with king and queen beds, ceiling fans and mountain chic decor, Cozy Lakeview's two bedrooms beckon you for a restful night. You'll find antique storage pieces and local handicrafts and plenty of closet storage in the main floor master and in the loft bedroom, a custom headboard, antique armoire and desk, and a chair and ottoman perfect for reading a good book while taking in the magnificent view. There are two bathrooms in the cabin, a full bath with shower on the main level and a powder room with sink and toilet upstairs. Other amenities include washer/dryer and electric grill and hot tub, so you can soak your cares away. For a couple wanting to reconnect and unplug (not child friendly with open staircase and hot woodburning stove). Cozy Lakeview will soothe and comfort you and fill you with a sense of peace that you can only find when you're surrounded by nature. Your worries and cares will melt away like magic, and you'll feel relaxed and renewed - and never want to leave. 03/19 - We enjoyed the screened porch and the hot tub. 03/19 - Beautiful view, comfortable and very relaxing. The staff are very responsive and helpful. 01/19 - The mountain view and the hot tub are awesome. Very generous and helpful staff, I will be booking with you guys again soon! 09/18 - Enjoyed the hot tub and the outside porch. The staff were attentive and helpful. 09/18 - All the comforts of home with a breathtaking view. The company is very detail oriented and concerned about everything being ideal for our vacation. 07/18 - The size of the home was perfect for our honeymoon. This is the 2nd time we have rented from Escape to Blue Ridge and we will continue to rent from you. I really enjoy Blue Ridge, GA and the convenience of cabin rentals is fantastic. 07/18 - Fantastic cabin and views! Perfect for my hubby and me. Very satisfied and would definitely love to return. 06/18 - It was well equipped and clean ...very nice and cozy. 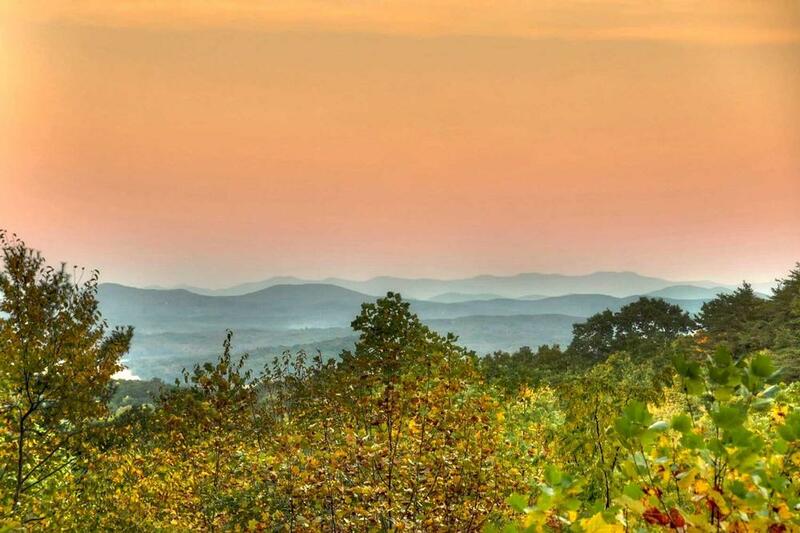 We have been coming to Blue Ridge for a few years, love it..
05/18 - We loved the secluded beauty, the mountain view, the screened-in porch and the breezes through the windows. You did an excellent job with management! 05/18 - Charming cabin. Company is very thorough, everything was as expected. 05/18 - Our cabin was awesome. Beautiful view. We were celebrating our 23rd anniversary and couldn't ask for a better getaway. Very peaceful and relaxing. Want to come back with my children and grandchildren. Love the company. 3/18 - The view is amazing. Although other homes are around, you really would never know it, you’re on your own private hill. We took a dip in the hot tub every day. Kitchen has everything you need. The staff are friendly and very helpful. 3/18 - The fully equipped kitchen and the cleanliness of all of the bedding and pillows as well as the hot tub. Great company!! 2/18 - We enjoyed the quietness and peacefulness of the property. We felt right at home and everyone in town was so nice and welcoming! The staff were very professional and available. Loved it! 2/18 - The screened-in porch view with hot tub was amazing. A wonderful and cozy place to relax. Nothing over the top, just nice and simple. It rained our entire weekend, but it was great since the hot tub was under the porch, we could still enjoy it and the metal roof was just magical to listen to. We also really enjoyed the wood burning stove. Simply perfect. You all have always been very professional and organized. Thank you! 10/17- We loved being alone in the mountains and the view from the back deck of the cabin was amazing. Your company and employees are great. Everyone was very polite and attentive, from my initial reservation call all the way through checkout. 09/17- We loved the porch. It was our favorite place to sit in the rocking chairs and drink our coffee and eat our meals. The loft bedroom is perfect for sleeping with a view. The whole place was fantastic and we cannot wait to come back! We were so impressed with the personal touches that you left for us when we first arrived! We cannot thank your company enough for making this such a great vacation for us. 10/17- I loved the binder with all the recommendations! It was well organized and detailed! It's obvious this took a long time to assemble and I appreciate time and effort put into it. After staying in dozens of mountain cabins, this one took the cake for coziness and decor. The owner must take great pride in ensuring the guests are blown away aesthetically and as comfortable as possible. Not a single detail was overlooked and I can't say enough great things about this cabin. I was very pleased with how organized everything was. Response time was quick and emails regarding reservations were detailed. In a single word, I would say exceptional. Without a doubt, I will recommend and use this company again. 09/17- Felt as if I was at my own vacation home. I have already recommended this cabin to friends. Great! 09/17- The personal touch of the house when we walked in made this place feel like we were home. It was so nice and so beautiful! Very thorough and helpful with directions, things to do around the town and just having things there that we didn't even think of! We will definitely be back! 07/17- It was like home away from home and more. Very professional and courteous. 07/17- Sitting in the hot tub on the screened in porch when it was raining and looking at the mountains and lake was wonderful. Just like a postcard picture. Also all the things provided like at a hotel, but privacy and quiet solitude. Nice people, very helpful in every way. Made arrangements EASY! Gift bag on arrival was nice too. 07/17- The view was amazing, the cabin was supplied with everything we needed, very relaxing. We did not want to leave. Excellent staff. 06/17- The view is awesome! The staff are always helpful. 06/17- The location and views were excellent. Enjoyed the hot tub and the tranquility of the area. Very professional and customer oriented. 02/17- So quaint and cozy and absolutely everything I was hoping it would be. I loved the wood burning stove. Excellent company! Very friendly and extremely helpful staff. 01/17- I loved the view and the coziness of the cabin. 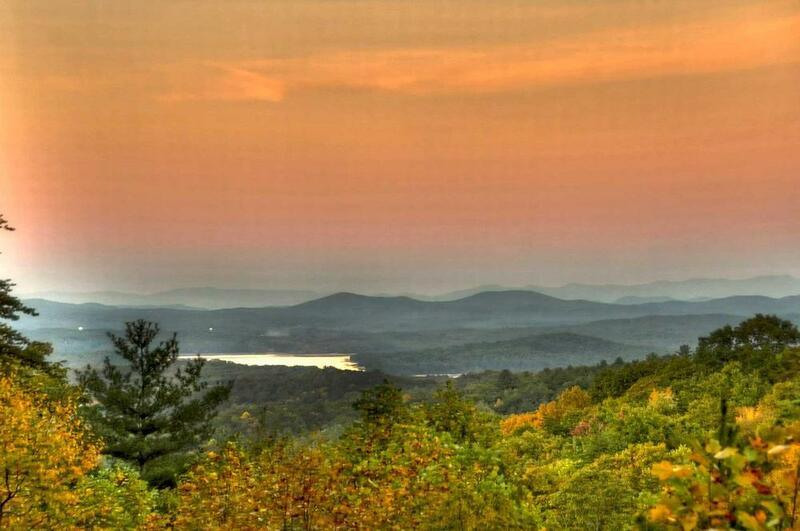 I have been to Blue Ridge before and plan on returning. I think the employees do a wonderful job. 12/16- We really enjoyed how clean everything was. The home came well equipped with things we needed during our stay. It was the perfect size for me and my boyfriend. Very well organized and friendly staff. 12/16- Great little cabin with all the comforts of home! Perfect size for the two of us! Loved the screened in porch! Have always had excellent customer service from the staff. 11/16- Nice view, clean, cozy and very home like. Very nice company and will book with you again. 10/16- Our favorite features of this home were the view and the screened porch. From start to finish your web site and the people I corresponded with were very professional. 10/16- Kitchen was well furnished as well as the rest of the cabin. Quiet and peaceful but not difficult to get to. Enjoyed our time. Very impressed with the professional staff. 09/16- Our favorite features of the cabin were the attention to detail along with the overall cleanliness. We were impressed with the company. 09/16- The cabin was very clean & all the necessary local & cabin information was readily available. The staff are friendly, kind & caring. 08/16- View, accommodations. Very good. 08/16- Awesome mountian views and valleys. Company is very personal and courteous. 07/16- It included everything we need and all we had to bring were groceries. The view is spectacular, and the hot tub with the view of the lake is fabulous. The pictures of the cabin on the website were very accurate, and the cabin fulfilled our expectations when we arrives. The directions provided were also very good. 07/16- This great little cabin was everything it said it would be. We really enjoyed staying there. It was just a great place to relax and unwind. Why would anyone want to stay in a hotel when you can have the privacy and affordability of a beautiful mountain cabin? The only problem we had was that we couldn't stay long enough!!! 06/16- The design and decor of the house were beautifully done, and the view from the screened-in porch was gorgeous. 04/16- We enjoyed all aspects of this home. The view close to the property's deck is not that great due to visibility of powerline and neighboring property's roof. 04/16- Size-wise, it was exactly what my wife I were looking for in this visit - a small home for just the two of us to get away too Overall, I enjoy working with your company. Properties have suited our needs and will use you again. 03/16- Seclusion. Screened porch. Views were all favorites. We always have a positive experience!. 03/16- As soon as I opened the door, I was in love! This cabin was super clean, cozy - just the right size, and the location was perfect. I love the rustic feel. The kitchen was well equipped with everything needed for cooking. It was so peaceful and quiet, just what we were looking for. We plan to hopefully go back in the fall. Everyone was very helpful and responded to my request in searching for a smaller cabin. All paperwork was handled in a timely manner and no surprises. Great experience with the staff. Thank you. We will be coming back. 02/16- The location of this property and its amenities were the best! The customer service was impeccable. Guest Service Rep. Karen was very helpful during the entire process. 02/16- Location to town but still felt "away". All the attention to guests comforts. Loved the baskets in entertainment center with games, etc.. Beautiful upgrades but still cabin feel. Great customer service. Very responsive. 11/15- The view and the enclosed hottub were awesome. I thought the cabin had an excellent theme and everything was provided that anyone could thing they would need during their stay there. I was exetremely impressed with the company and how easy it was to book the cabin. I especially liked the fact you could go directly to the cabin without have to stop in a different location to pickup a key. I look forward to returning in the summer. 11/15- It has the feel of a homey lake house.